My homemaker came and amongst laundry and shopping, we had some laughs and I showed her a couple of vids from Hair and Jesus Christ, Superstar. I am going through my old VCR tapes so I can toss them, and two nights ago I found one with Hair. Kind of fast-forwarded to just get the music, but the end scenes just broke my heart. Burst into tears, actually. 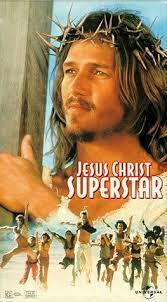 So I was YouTubing for vids of just the music, which then led me to Jesus Christ, Superstar from the sidebar. God, I love YouTube. You can watch entire movies, listen to entire soundtracks. So my homemaker, who wasn’t even born when the movies were made, was just blown away especially by the ones from Superstar. She was astounded that black people were featured. Yes, the world has changed, and for the better if you ask me (RI had gay couples getting married yesterday. Yay, RI. I live right next door in Mass.) and I think she has seen/read about how things were back then for people of color. I’m not religious. In fact, I am an atheist and proud of it, but religion isn’t necessary to love a really, really powerful movie like Superstar, any more than having been a soldier or a hippie is necessary to love Hair. Check them out. You won’t be sorry. I also found that they are redoing Superstar with Tim Minchin. Tim Minchin. I love Tim Minchin. Check him out. Addendum: I’m also not gay. I support gay rights, because I believe gay rights are human rights, and you only need to be human for that. Something which a lot of Americans seem not to be. Human, that is. They have lost their humanity in favor of religion-fueled hatred. Jesus would be so proud. HA!